Ship Weight : 45 lbs. 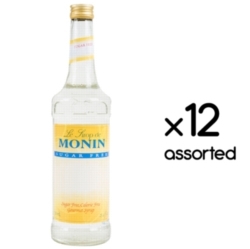 Monin Sugar Free flavored syrups are sweetened with erythritol and sucralose. Deliciously concentrated flavors derived from fruits, nuts, and spices! Experience delight delivered directly from Nature's treasure trove of flavors - without any calories! One case = 12 glass bottles. $0.32 / oz. $0.30 / oz. $0.28 / oz. $0.25 / oz. Due to levels of acidity, the Pomegranate (Sugar Free) is not recommended for use with dairy (milk, cream, half & half).